Many types of witchcraft are based on a period of history or a local culture, like Scottish witchcraft or Egyptian witchcraft. But some paths are tailored more to a kind of magick rather than a regional mythology. Kitchen witchcraft is one example, as is green witchcraft. And that's the one we're going to look at right now. 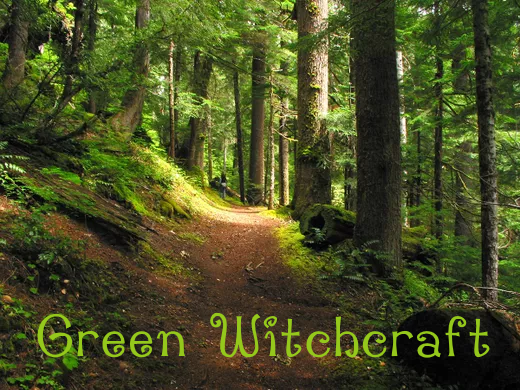 Basically, green witchcraft is a magickal practice that focuses on Nature in its beliefs, rituals and spells. It's usually quite simple, and doesn't rely on "fancy" tools or ingredients. Harnessing the basic energies of nature is all you need. These are just some examples of the kind of magick a green witch might be into. Sometimes, it's just a walk through the woods to get grounded with the Earth's energy and to get connected to the universe in the wild. Maybe offer a little food to the spirits of the area. Deities can be varied, and don't always connect with a specific pantheon. A general view of Mother Nature and Her consort, the Wild Man are very common in green witchcraft, though Gods and Goddesses from many cultures are connected to nature and may feel right to you. It is a very popular path, especially with very laid back or casual witches who are not interested in very intense or complex magickal workings. Several good books are on the market to help you find a place in green witchcraft if you are interested in this sort of practice. Here are two that I recommend. Feel free to click on them for more info.